Richard Koenig, proprietor and servant to Healing Spirit Plants, was born and raised on a Quaker farm in southeastern Pennsylvania. His family includes generations of farmers, horticulturists, and wandering naturalists. At age 3, Richard discovered a natural aptitude for plants, and found himself most grounded and comfortable out in Nature, “God found me here.” He holds a BA in Botany and Zoology, as well as a BS in wildlife Biology from the University of Montana. He has lived and traveled around the world, including Europe, the Middle East, China, Tibet, and the Amazon. Appreciation of the world’s cultures, Nature, and the beauty of consciousness transformation led to a seminary degree in 1992. 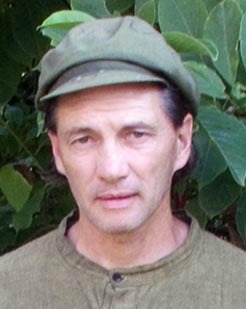 Richard has resided in Berkeley, California as a Horticultural Botanist, facilitating people’s connection with plants for the past 15 years. During that time, Plant Spirit medicine work has inspired the conscious unification of these karmic passions, in the vision of the gift of Healing Spirit Plants.